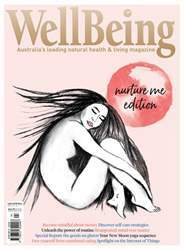 Take care of yourself this winter with WellBeing #175. Discover self-care strategies, inspiring stories and wellness advice in our annual Nurture Me edition. Become mindful about money, unleash the power of routine and harness the benefits of reappraisal. Read all about gluten in our Special Report, nourish your insides with delicious broth dishes and find out how to care for your “yoga body”. Learn 7 strategies to build resilience, how to live with spiritual doubt and free yourself from emotional eating. Make friends with polar bears in Canada, journey through Tasmania’s East Coast and discover the healing powers of olive leaf extract, matcha and jojoba. Enjoy a yoga sequence for the New Moon, learn all about the moon’s effects and craft your own biophilic home. Explore the Internet of Things, the humbling story of healer Denise Linn plus loads, loads more!